Horses and dogs have always been a must in my life, and it’s clear that the many members of the equine community feel the same. Horse people are quite often also dog people. When I finally reached a point in my life as an adult when I could have a dog, it took me about two months of research to find the right one: Patch. Patch is a Miniature Australian Shepherd who was too shy to herd goats on his farm in Illinois. A home with me where he could be himself and tag along on trail rides was perfect. Patch was incredibly timid: he peed in fear when my roommate’s 6-month-old kitten looked at him. 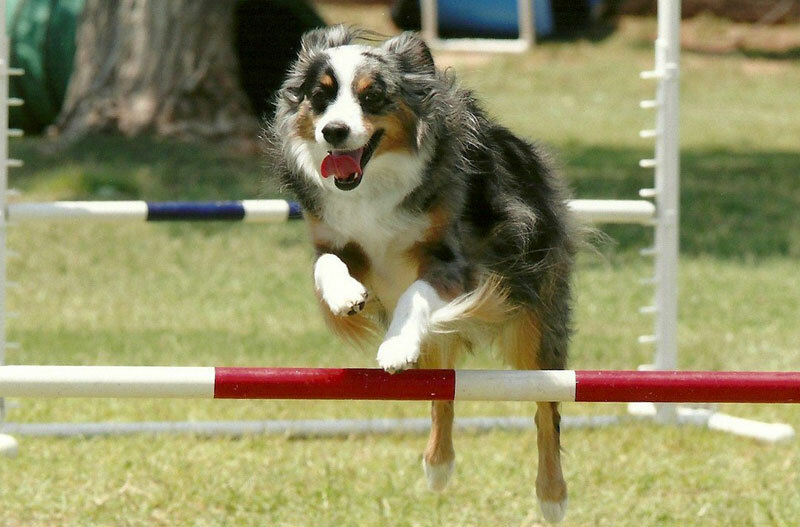 I decided to take him to agility classes, and with each learned skill, his confidence grew. I had multiple trainers tell me they could tell I had worked with horses before. My body language, patience and timing couldn’t be an accident. One of the biggest similarities I’ve found between dogs and horses is the importance of nonverbal communication and patience. 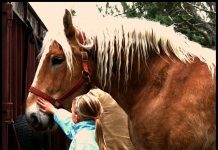 With horses, you know you can’t force a 1,000-pound animal to willingly walk through a gate. You have to make it the desirable option. While all dogs weigh considerably less than a horse, you can still teach them to do things without sheer strength. It’s about patience and choices. With Patch, if I use force in any way, he shuts down. It’s all about how I ask him to do things. I’ve experienced the same thing with timid horses. Remember the importance of body language and eye contact. If you’re looking at the ground while on your horse, he’s not going to willingly move forward. Look up, and your horse will become willing. It’s the same with your dog. If you’re staring at the ground and you want him to chase after a ball – look at the ball! Not all aspects of training dogs and horses are the same. For one thing, my biggest aids on my horse are my hands, seat, legs and voice. My voice is an aid for my dog, but my hands, seat and legs are not. I’m not sitting on my dog when I ask him to turn left. I’m not using outside leg pressure to ask him to come around the table and sit at my feet. The reward program is also slightly different. When working with dogs, you need to decide what motivates them. Is it treats? Toys? Praise? 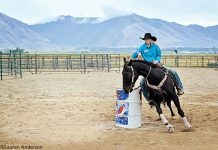 With horses, you might teach small tricks with treats, but praise is the most common reward for doing things right, along with a release of pressure. No matter what you’re training for, make sure it is an attainable goal and that you set up the situation for success. 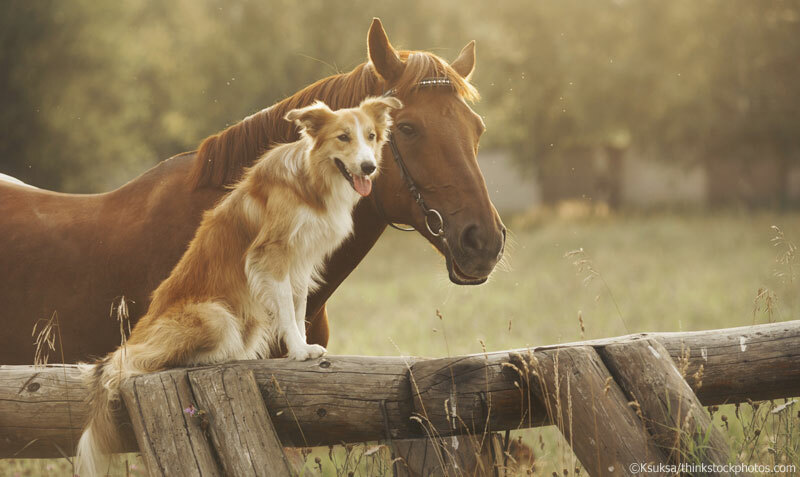 For both dogs and horses, you need to take things one step at a time. For example, when you start a horse over fences, you start with ground poles in a safe, controlled environment. When you start teaching a dog how to stay, you do it in a contained, safe space where there aren’t too many distractions. As your horse gets more confident with a ground pole, you can move to a small crossrail, and as your dog gets better at the stay command, you can increase the distance between you two and increase the amount of time you ask him to wait. Make no mistake – I know Patch isn’t a horse. What I do know is that soft body language and patience have powers in all animals. Celebrate small victories and don’t rush the training process. Animal training is a rewarding experience. Just ask Patch – he now willingly says hello to 6-month-old kittens. He can run a pretty fast agility course, too. Absolutely! I definitely use techniques from training all my animals for all my animals.